Article by The Economist (21.12.15), link. ….Now they must live with the consequences. 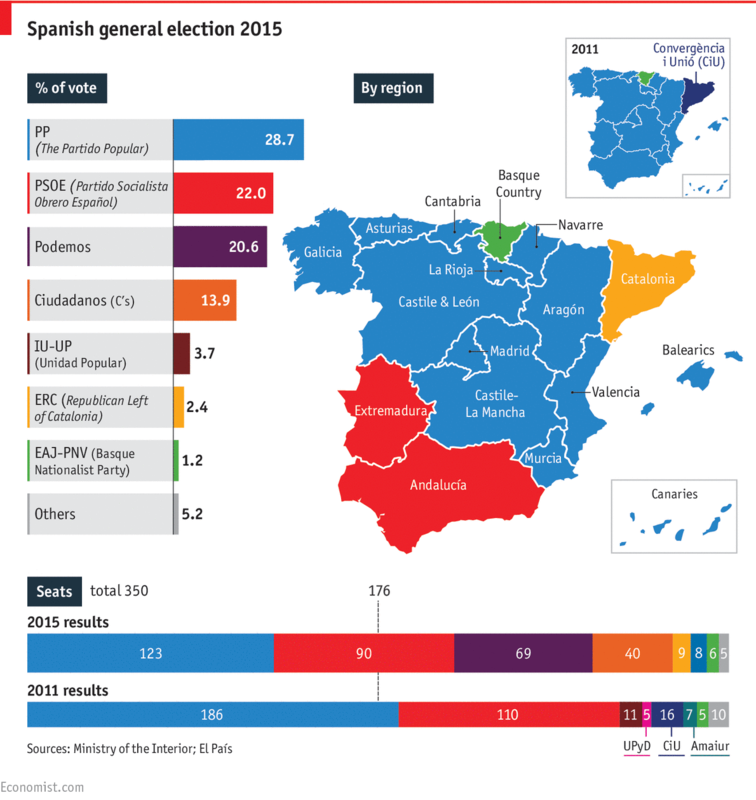 ELECTION night in Spain on December 20th ended with a disturbingly messy result. Neither the incumbent prime minister Mariano Rajoy, whose conservative People’s party (PP) lost 43 of its 186 seats, nor the Socialists (PSOE) of Pedro Sanchez can form a government without the help of the new insurgents of anti-austerity Podemos or the new liberal party, Ciudadanos. Even that may not be enough. As many as five parties may be needed to form a new government. That will not happen in a hurry. Mr Rajoy will try first but will probably fail when he puts his candidacy to the vote in parliament, where his party made many enemies during its four years with an absolute majority. After that, Mr Sanchez has two months to form a government. If he also fails, then new elections must be called. With the 2016 budget already in place, that is not as terrible as it sounds—but a vote for change may yet produce months of stagnation. Sunday’s results confirmed the demise of Spain’s two-party system. PP and the Socialists took just 50% of the vote between them, down from 73% four years ago. The new insurgent parties are not yet strong enough to replace them. But nor can they be ignored. 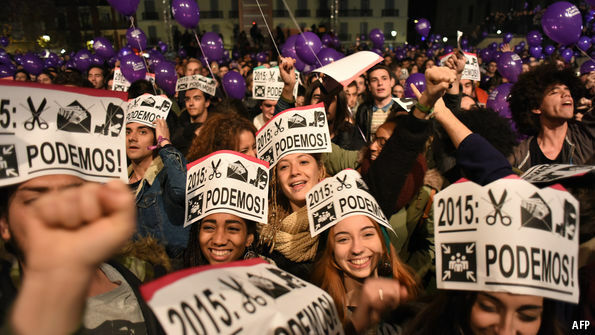 Podemos is no longer a fringe protest group, but a mainstream party which only narrowly failed to topple the Socialists as leaders on the left. Albert Rivera’s Ciudadanos showed that dissatisfaction with the status quo stretches across the political spectrum. If Spain wants stable government, an agreement between two or three of these parties is the only real option. Otherwise a new government will need the backing of Catalonia’s increasingly belligerent and rebellious separatists who, in yet another blow to the status quo, took a key bloc of seats. A “grand coalition” deal between PP and PSOE would be the most stable, but it would be political suicide for the latter. A broader coalition with PSOE, Podemos and Ciudadanos would allow the newcomers to clean up the cronyism and corruption that have tarnished the political establishment, but the upstarts have little common ground on the economy and Catalonia. Podemos, meanwhile, can be expected to stab Mr Sanchez in the back if it sees an opportunity to overtake the Socialists and make them as irrelevant as, say, Greece’s socilaist party, PASOK. Some very big questions are now being thrown up for debate. Podemos’s leader, Pablo Iglesias, wants constitutional reform to enshrine social rights in stone and define a new special status for Catalonia in order to dampen separatism there. Both he and Mr Rivera want electoral reform to introduce pure proportional representation, a move that would also open the door to extremist parties of the left and right. Catalan separatists, meanwhile, want a referendum. Yet constitutional reform is impossible without Mr Rajoy’s PP, which still has more than one-third of parliamentary seats, sufficient to block any changes. Grand demands for major reforms may, in any case, be missing the point. What Spaniards need most urgently are jobs. They also need long-term, cross-party deals on pensions, education and the like. For the past half-dozen years Spain has obediently followed European rules on austerity and internal devaluation. That has allowed the economy to turn the corner, but Spaniards have paid a steep price in unemployment (now running at 21%), a high degree of labour instability and a bruised sense of national pride. With its economic output still below 2007 levels, Spain is slipping down the world rankings of GDP. Spanish stoicism has been impressive, but while ordinary Spaniards suffered, the established parties looked after their own through corruption. Voters took their revenge on Sunday. Now they must live with the results. Catalonia Elections – A New Roadmap to Independence?